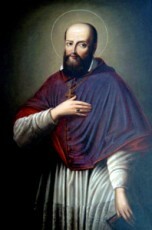 St. Francis de Morales was a Dominican martyr of Japan. He was a native of Madrid, Spain, and served for two decades in Satsuma, Japan. In 1614 he went o Nagasaki, and was burned alive with Blessed Charles Spinola and his companions. The shogunate and imperial governments at first supported the Catholic mission and the missionaries. Their thinking was that they would reduce the power of the Buddhist monks, and ultimately help their trade with Spain and Portugal. However, they were weary that the Spanish would take power, converting the population. The government increasingly seen Roman Catholicism as a threat, and started persecuting Christians. Christianity was banned, and those that refused to abandon their faith, were killed. On February 5, 1597, twenty-six Christians, six European Franciscan missionaries, three Japanese Jesuits and seventeen Japanese laymen including three young boys, were executed by crucifixion in Nagasaki. These individuals were raised on crosses and then pierced through, with spears. This continued sporadically, through 1632. In September 1632, fifty five Christians were martyred in Nagasaki in what became known as the Great Genna Martyrdom. By now, Roman Catholicism was officially outlawed. The Church remained without clergy and theological teaching disintegrated until the arrival of Western missionaries in the nineteenth century. These martyrs were canonized by the Roman Catholic Church on June 8, 1862 by Blessed Pius IX and are listed on the Church Calendar. It is not known how many Christians were executed in Japan as records were either destroyed or not kept. So many of these great Saints were fearless in spreading the Christian faith, to those that have never heard of Christ. St. Francis de Morales knew that going into Japan could cost him his life, as there were sporadic execution of Roman Catholics in that country in his time. He being a missionary, moved forward and preached the Gospel of Christ to those in Japan, converting many. He ultimately was burned alive because of his works in conversion of the Japanese people. We continue to learn that many gave their lives up willingly to save souls, and yet we often don’t even study the faith ourselves. We have the opportunity by studying this saint’s life, to learn the faith, and then teach it to those around us, who have not yet met Christ.